Today’s canticle, found at the beginning of the Letter to the Ephesians, is a hymn of praise which has at its centre the figure of Christ in whom the work of God the Father is revealed and accomplished. In Jesus we are chosen and through him we are lavished with grace; indeed in this way the Son becomes the epiphany of the Father’s love which envelops and transforms us. Such unconditional and limitless love reveals to us the glorious depths of the mystery of God’s will which intends to gather all creation and history into the fulness wished by him: "a plan to be carried out in Christ ... to bring all things into one" (Eph. 1:10), healing divisions and overcoming human weaknesses. Reflecting on this depiction of the history of creation and salvation, Saint Irenaeus affirms that, since the Word of God truly becomes man, sin and death are defeated and all people are renewed in Christ. Together with Saint Irenaeus let us rejoice at the marvels of God’s loving plan for each of us! I extend a warm welcome to the English-speaking pilgrims here today, including groups from England, Australia, the Philippines and the United States of America. May you have a memorable stay in Rome and a safe return to your homes. Upon all of you, I invoke the peace and joy of Jesus Christ our Lord! Thanks, Ratzigirl. You are spoiling us with all your kind attention. "On the First Sunday of Advent I welcome all the English-speaking pilgrims and visitors present for our Angelus prayer. May this season of joyful expectation and spiritual preparation for Lord’s coming be a time of sincere conversion and interior renewal for all Christians. Upon you and your families I cordially invoke God’s blessings of wisdom, joy and peace." thanks! one more day and Audience time again..hmm,i wonder if theyll transfer to PaulV1 hall for this one. Psalm 136, the subject of this week’s catechesis, is a song of lamentation for the destruction of Jerusalem and the Babylonian Exile, a heartfelt prayer for liberation and an expression of longing for the Holy City. Its evocation of Babylon as a place of slavery and sorrow can be seen as a symbolic foreshadowing of the horrors of the death camps of the last century, in which the Jewish people were destined to extermination. In their grief, the exiles are no longer able to sing "the songs of the Lord," which can only rise up to God in freedom and in the setting of liturgical prayer. During this Advent season, the Church reads this Psalm, with its plea for liberation and its nostalgic yearning for the Holy City, as an expression of her own prayerful hope for the Lord’s coming. As Saint Augustine tells us, we are called not only to sing this Psalm, but to live it, by lifting up our hearts with profound religious longing for the heavenly Jerusalem. I offer a warm welcome to the English-speaking pilgrims and visitors present at today’s Audience, and in particular to the various student groups. May this Advent be for all of you a time of reflection, prayer and joyful expectation in preparation for the mystery of Christmas. Upon you and your families I cordially invoke God’s abundant blessings of joy and peace. CTV IS REPLAYING THE GENERAL AUDIENCE NOW! If you missed it at 4 a.m. today (EWTN also had it then)- the replay started 5 minutes ago - 10 a.m. New York time. conversed, and then CTV faded out on the scene because the hour was up! I greet all those present for today’s Angelus. On this Second Sunday of Advent, Christians throughout the world are called to "prepare a way for the Lord". 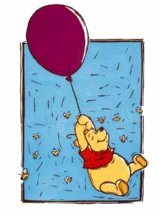 May we always make a place for him in our hearts and in our lives. Upon all the English-speaking pilgrims and visitors, I invoke the blessings of Almighty God. You are really kind, posting all these messages in English for us. It's good that we have this "togetherness" on the forum. I was wondering when the audiences are likely to be transferred to the Paul VI hall. During August the general audience was held in there on two occasions, I think it was. Was that because it was too hot in Saint Peter's Square? Now they will surely have to go indoors for the winter. But I don't know - it may not get much colder in Rome. You can tell us that. All I know is that Rome is exactly ten degrees latitude farther south than where I live: I am at 51 degrees north and Rome is 41 north! With the numbers that have been attending the audiences recently, they will never all fit into that hall and many people will be disappointed. Do let us know if you have any information. Today I would like to reflect with you on Psalm one hundred and thirty-seven, a hymn of thanksgiving. From the temple in Jerusalem, the psalmist lifts his voice in praise and adoration of God. Despite trials and tribulations, he is confident that the ever faithful God will hear him. What began as the psalmist’s personal prayer becomes a song of praise from "all the kings of the earth", giving glory to God who "looks on the lowly" and comes to the aid of the oppressed. Finally the psalmist prays that the Lord will continue to watch over him and to protect him from danger in the future. In the words of Saint Ephraim, "Praise to you, for whom all things are possible; praise to you from all those who understand your truth". I welcome the English-speaking pilgrims here today, from Australia, Canada, England, Finland, and the United States of America. A special greeting to the newly-professed Missionaries of Charity, to the English priests who are celebrating their tenth anniversary of ordination and to the choir members from Veteli in Finland. I pray that your visit to Rome will strengthen your faith and your love for the Lord. May God bless you all. Maklara, If you had not already done so, I was going to post the same picture here, because I too found it strikingly symbolic - the morning sun setting the cross ablaze. 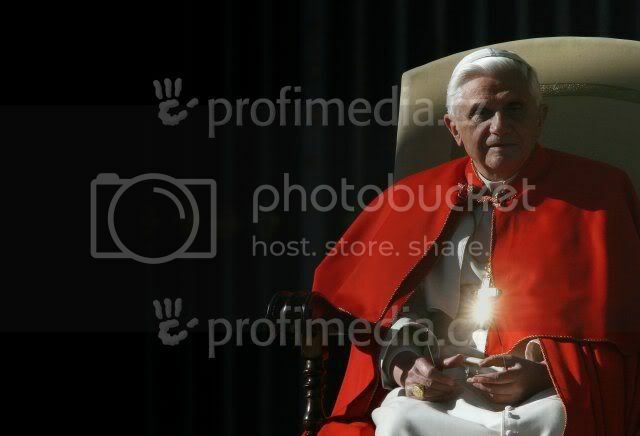 Ratzigirl earlier posted this picture of Papa with the sun striking his forehead, and she captioned it "Truth casts its light on Papa so that he can bring the True Word to all the world." he truly is a light,a beam for Jesus! 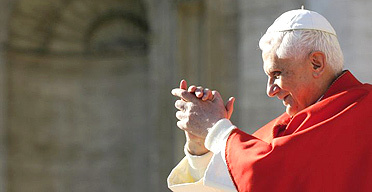 and click on "Benedicto XVI, Portal..." which will get you to the home page of one of the best Benedict sites anywhere. They will usually have the latest Angelus or Audience replay within a few days of the event (in the case of the Angelus, almost immediately). This morning, Papa suggested that parents should dust off the nativity scene and emphasize the events of the first Christmas instead of focusing on endless shopping. for Papa's general audience. Earlier, CTV's pre-announcements of upcoming December events had stated the location of the 12/14 audience as the Aula Paolo VI, which only holds 7,000 at a maximum. I should have known - Sylvie as usual has already completed a montage of the CPP photos. These photomontages get better all the time!